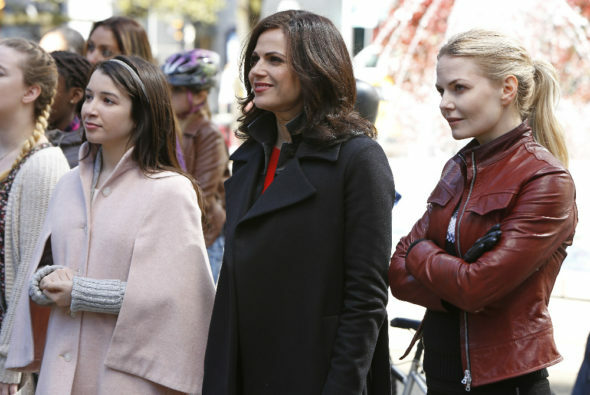 In its sixth season, ABC’s Once Upon a Time TV show is going back to basics. During an ATX Television Festival panel for Freeform‘s upcoming Dead of Summer TV series, executive producer Edward Kitsis promised Once Upon a Time, season six, will differ from previous seasons. For the past three seasons, ABC scheduled Once Upon a Time in two (largely) uninterrupted blocks of 11 episodes each. 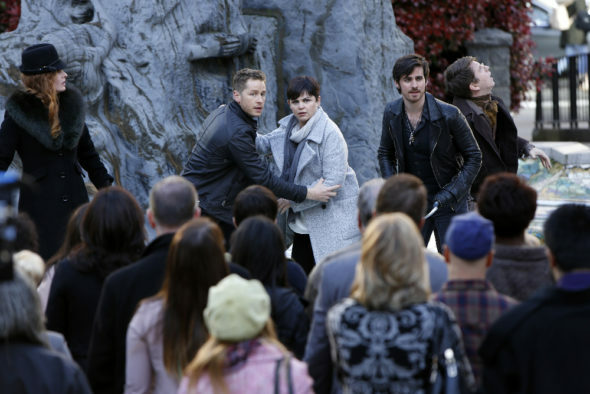 Creators Kitsis and Adam Horowitz took advantage of that and featured one story in the first half of the season and another in the second. Season six of Once Upon a Time, starring Ginnifer Goodwin, Jennifer Morrison, Lana Parrilla, Josh Dallas, Robert Carlyle, and Colin O’Donoghue, will be approached as a 22 episode whole. In season 6, the show will be exploring more tales from the Land of Untold Stories, which opens up new and endless possibilities for storytelling. (Check out some of those possibilities here.) But that doesn’t mean the heroes and villains we’ve come to know and love are taking a backseat — in fact, it’s the opposite. 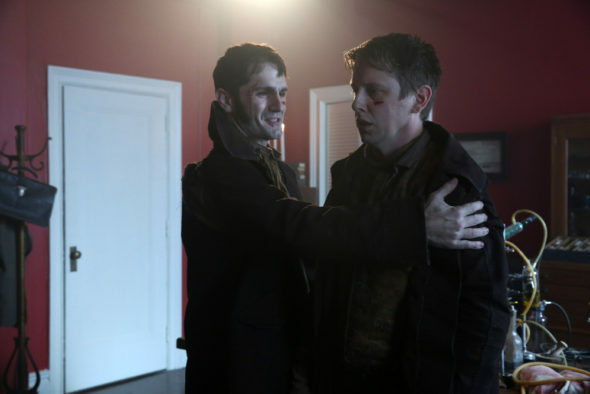 The Once Upon a Time season five finale, “An Untold Story,” introduced Jekyll and Hyde (Hank Harris and Sam Witwer) who will feature in season six. Henry’s (Jared Gilmore) girlfriend, Camelot native Violet (Olivia Steele Falconer) is the daughter of Sir Morgan, who, in the finale, was revealed to be Hank Morgan of Mark Twain’s A Connecticut Yankee in King Arthur’s Court. After the finale aired, EW pored over screenshots from the episode, looking for Easter Eggs that might provide a clue as to which stories from the Land of Untold Stories. At the New York City Public Library, Henry finds storybooks not unlike his own special tome. Screenshots of the books in the EW article reveal stories including The Ingenious Gentleman Don Quixote of La Mancha; The Water-Babies, A Fairy Tale for a Land Baby; Gulliver’s Travels; Twenty Thousand Leagues Under the Sea; and Paul Bunyan. Easter Eggs EW spotted in the scenes from the Land of Untold Stories include The Three Musketeers, the Knight of the Holy Grail, and oh-so-briefly, cowboys! Some fans have identified Aladdin and Jasmine, as well as Esmerelda (from The Hunchback of Notre Dame). There was also a hot air balloon, pictured in the screencap, below. Around the World in 80 Days (Jules Verne), anyone? Once Upon a Time TV show on ABC season five finale. Screencap via kissthemgoodbye.net. 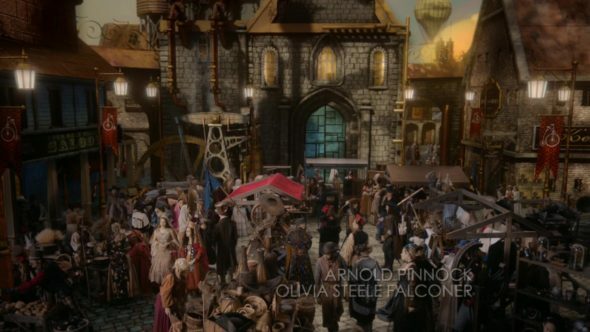 The first season of the Once Upon a Time TV series remains a fan favorite. Some viewers have grown tired of the two mini-seasons-in-one format. A 22 episode story made up of small town stories with shorter arcs might be just the ticket for the sixth season of Once Upon a Time. What do you think? 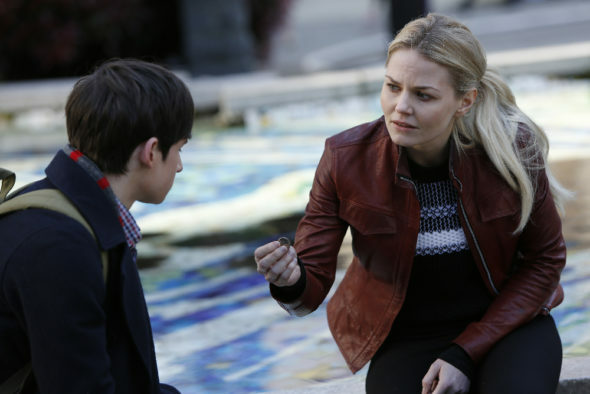 “Once Upon a Time”‘s ratings were really low during its fifth season. The two-mini-seasons-in-one format must cause ratings to be lower in the second half of the season rather than the first half. The cancellation of “Galavant” (which aired during the midseason hiatus of “OUaT”‘s fourth and fifth season) would allow some breathing room for “OUaT” next season, so I hope “OUaT”‘s viewership rises for its sixth season now that the two-mini-seasons-in-one format has been dropped. The ratings are always lower in the second half of the season because Football always wins the night, but still, I think you’re right that the format was losing viewers. I am looking forward to a 22 episode story. I am excited at this news of a change back. Ive been a bit bored at times the past couple of years & most of the time cant wait until the 1/2 year is wrapped up because I am so sick of the guest character (i.e., peter pan, hades). I was never close to not watching anymore, however…my love for the original cast prevents me from ever wanting this show to end! Personally, I have loved every season and every storyline…always excited to see what storyline & characters will pop up next! !